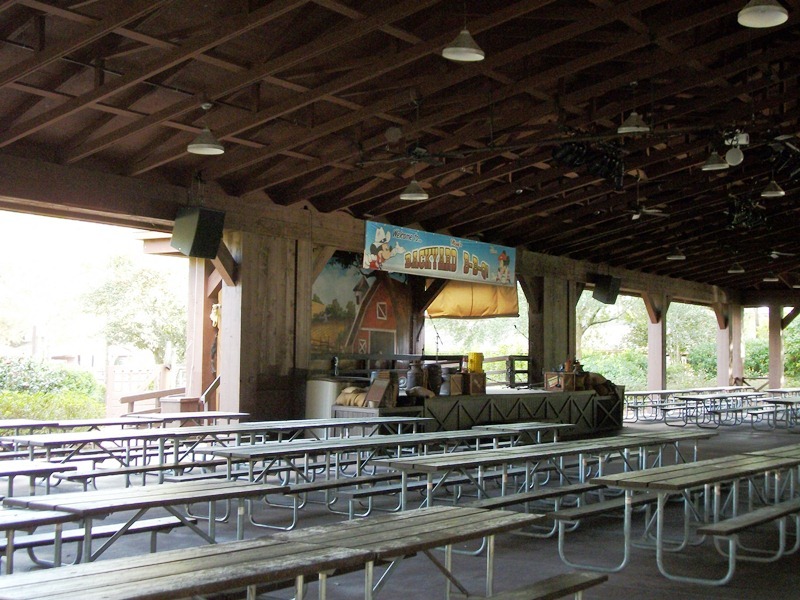 Have you ever attended Mickey’s Backyard BBQ and thought that some of the landscaping seemed a bit out of place? Okay, you were probably more focused on the ribs, corn on the cob, beans, slaw, cornbread and other down home fixin’s, and no one could possibly blame you for paying more attention to the smorgasbord in front of you. However, beyond the feast for your stomach is a feast for the eyes that harkens back to Walt Disney World's first water park. 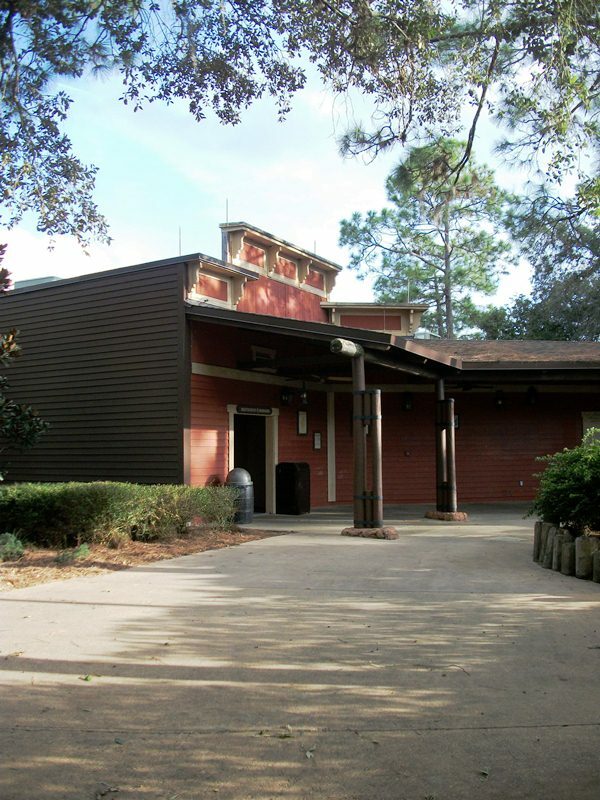 The Fort Wilderness Pavilion, home to Mickey’s Backyard BBQ, was once home to another Walt Disney World and Fort Wilderness staple, River Country. River Country was a water park that featured a variety of water and tube slides, zip-line plunges, and other water play elements, but was shuttered in 2001. For those who remember, the signs are everywhere. The pavilion itself has been remodeled, but it was River Country’s Cookout Pavilion once upon a time. Upon arrival at Mickey’s Backyard BBQ you pass by two pieces of River Country’s past. 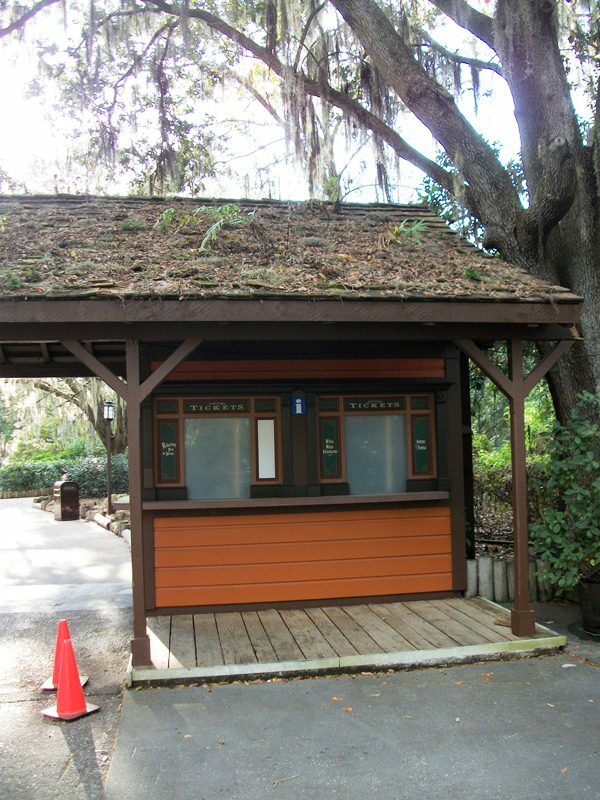 The first is the two-window ticket booth, a booth that boasts ‘Relaxing Pool & Springs,’ ‘White Water Adventures,’ ‘Scenic Vistas,’ and even ‘Guest Services,’ although they're missing the slat that used to advertise 'Old Fashioned Fun.' 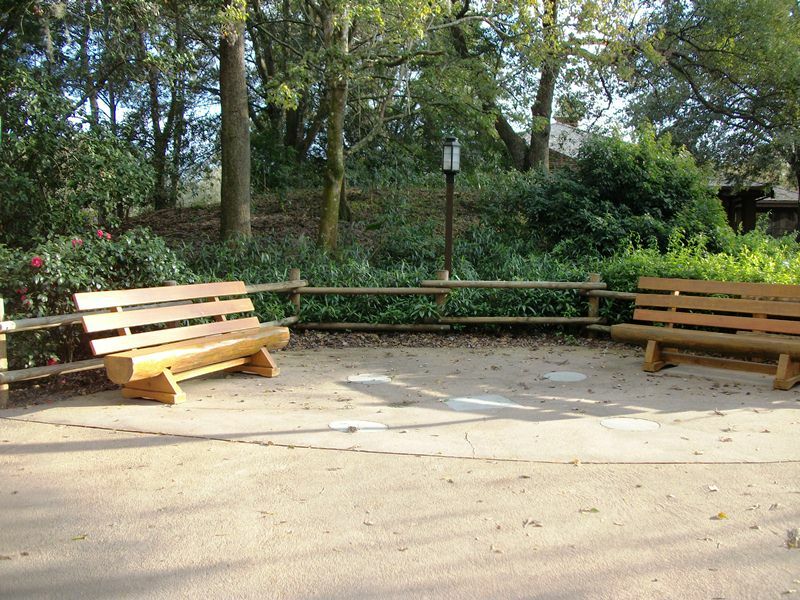 The second is a seating area that has an odd concrete pattern. The four circles and center square were actually the legs of the old River Country water tower that was removed and installed as part of the slide at the Meadow Pool during the pool’s 2009 refurbishment. As you make your way around, you may also notice some rockwork, aka giant boulders, that seem out of place for Fort Wilderness. 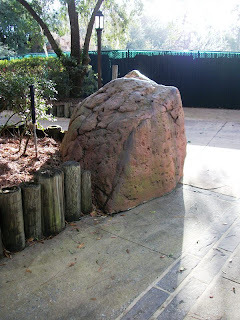 They too are remnants from the rocky outcroppings that were once River Country. 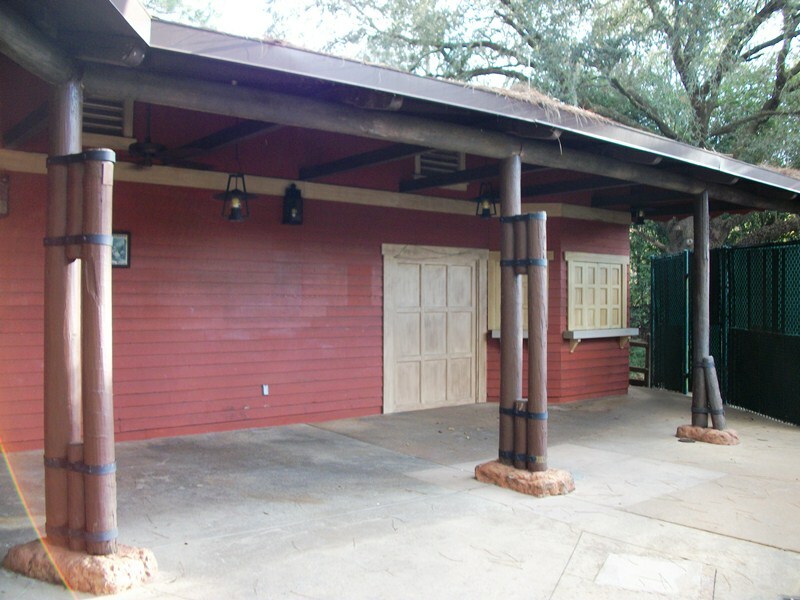 The red building at the rear, home to restrooms for Mickey’s Backyard BBQ, was once home to the showers and facilities for River Country. This is evident from the ‘Restroom and Showers’ signage. However, this same structure also housed the Towel Rental and Lost & Found for River Country. This is the section of the building with the white wooden door and folding dividers. Now, I’ve know we’ve all seen the photographs of what River Country has become and we all know it isn’t a pretty picture. Yes, there are holes in the fence where guests have fought their way through to take photographs of their own, I snapped one or two myself through the camera-sized holes I found (I may even share them some day. ), but I cannot condone going beyond the fences. It is not safe and it is trespassing. I’d love to get a tour of what is left of River Country one day, to photograph the sites of what was so that I may dream and write about what could be, but that invite has to come from Walt Disney World. While I am not a fan of letting this once gorgeous area simply collapse into decay, Fort Wilderness has done a fine job of reworking and refreshing some of the elements of River Country. I, for one, am thankful for the pieces that remain in functional condition, in open areas, that allow me to meander through my memories of the old watering hole. This is a great post. I love learning about the defunct items on property, i.e. the old ticket booths. 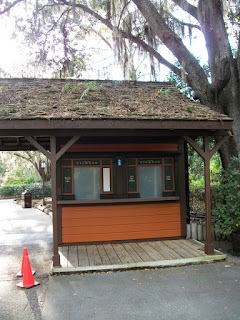 Recently I was noticing some of the old ticket booths still in the Magic Kingdom. I would love to read a post about the ones that still remain! I wish I'd been able to experience River Country; it looked like such a charming and relaxing way to spend an afternoon! Darren - There is a lot to discover once you start digging into pieces of Walt Disney World that are no longer in use. I'll see what I can do about booths and kiosks for you! Rich - It was a charming, little swimming playground, but that was also the reason that it could not stand up to the giants of Typhoon Lagoon and Blizzard Beach when they arrived. I keep hoping it will, in some form or fashion, be revitalized as an exclusive pool area for the Wilderness resort set. One can dream, right? !